I’ve got a friend who loves movies. Much more than me, I think. She saw an interesting two part movies last year while attending the Toronto International Film Festival. It’s called The Disappearance of Eleanor Rigby but unlike traditional films, this one was split in two parts one subtitled Her and Him. Each of the two movies tell the same story but they follow the point of view of two different characters, one per movie. They work on their own but watched back to back they inform each other. She’s been talking to me about this movie (these movies?) for a whole year so when she found out that yet another version of the movie, this time subtitled Them, was going to be screaned at Cinéfest Sudbury International Film Festival (I’m classy like that), she convinced me to go see it. Even before seeing Them and having never seen Him or Her, I knew that this was going to be a different movie. For starters, Him and Her have a combined screen time of nearly 3 hours but Them is only 2 hours long. Something has likely been edited out of the combined film and frankly, I think that’s ok because it will assumedly be a different movie that what the viewers of Him and Her have seen anyway. That makes it an interesting movie before you even watch it. Thankfully Them was a good enough movie to make the three movie experimentation worthwhile and I’m confident enough to say this even though I’ve only ever see one of the three movies. I think it’s interesting to point that out that after the movie premiered in two parts at TIFF, the Weinstein Company purchased the distribution rights to the movie and apparently was part of the motivation to combine both movies together. I wasn’t able to find clear details on why Him and Her were edited into Them. It could have been direction from Weinstein Company but I think it's likely other reasons behind this since writer-director Ned Benson categorized his film as a “work in progress” when it was viewed at TIFF. Either way, Them has been released and I was lucky enough to watch it in a crowded theatre and I rather enjoyed it for being a bit unorthodox yet emotionally resonant film about loss and healing. Before I get to the movie proper, I want to talk about the inaccurate and misleading trailer for Them. I watched the trailer before seeing the movie and other than the foreknowledge I had of the movie’s previously separated point of view movies I didn’t know anything else about Them. Going into the theatre I thought it was going to be a romance film. I knew it definitively wasn’t a romantic comedy and thankfully the trailer didn’t try to make it look like one but it does try to make it a love story and that’s not quite what it is. At least, it’s not a movie about two people falling in love. It was more interesting and layered than that. The trailer didn’t provide me, a potential viewer, with the right set of expectations for the movie. It’s not very important because the movie obviously stands on its own but it’s a common thread in many movie trailers that they inaccurately portray the kind of movie they’re mean to be advertising. Them begins with a romantic evening out where we’re introduced to Eleanor (Jessica Chastain) and Connor (James McAvoy). It’s a cute scene and it shows the main characters at a point in their life where they were deeply happy. The next scene in the movie shifts gears emotionally and gives us the titular scene of Eleanor’s disappearance. The rest of the movie deal with two things: 1) the reason for her leaving Connor and 2) Connor and Eleanor dealing with the fact that they’ve seemingly separated, putting their marriage in limbo after seven years of being together. In less than ten minutes Benson established the couple and then tore them apart. It’s a bold way to start his first film. The rest of the plot felt familiar and likely will be to anyone who’s watched drama films. The story’s building blocks are nothing new but Benson uses them and presents them in a way that heightens the story being told. The first half of the movie plays almost like a mystery. By withholding one piece of information, the cause of Eleanor's disappearance, Benson involves the reader in the events of the movie. We’re paying close attention to what all the characters say in the hopes of finding out what happened. It made me feel a little voyeuristic. The characters on screen are all suffering in varying degrees and it felt a bit wrong to be snooping in on them. Once we find out what happen my feelings towards what was happening changed. I became increasingly concerned and worried for Eleanor, Connor and their families. I was worried they wouldn’t be able to recuperate from the event that transpired off-screen earlier in the movie. Them isn't a movie with twits but it’s a movie with many layers. It leads itself well to thought and interpretation. What starts off as a simple movie builds in complexity as the minutes pass by. 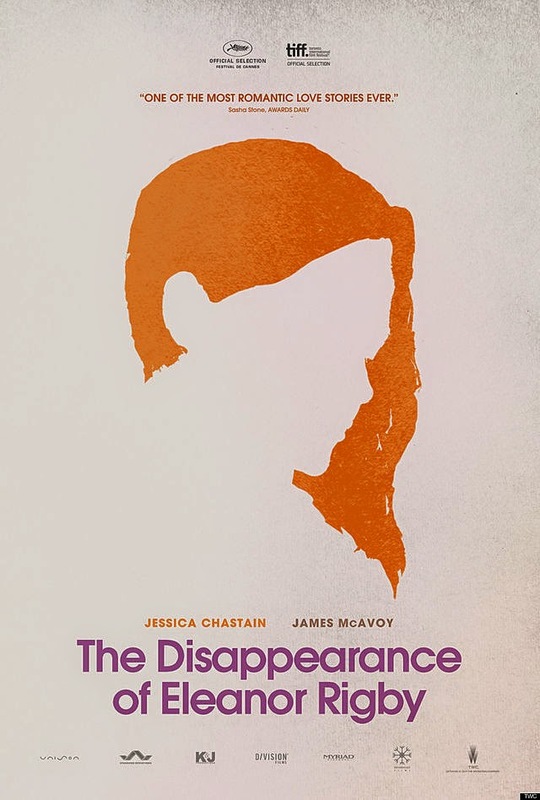 The acting by Chastain and McAvoy is impressively powerful and they’re surrounded by many other very good actors such as Viola Davis, William Hurt, Ciarán Hinds, and Jess Weixler. Even Bill Hader plays a satisfyingly serious role as Connor’s best friend. To see such a carefully constructed movie with a detailed script (few words are spoken that don’t contribute to the movie’s story and themes) so superbly acted out by such great actors was a treat in itself. It also helped that Them had something important to say about loss, emotional healing and the power of love. Most of the movie concerns itself with Eleanor and Connor’s healing process. It can see how this movie would have worked well in two parts, each focusing on one of the characters, because there are very interesting similarities and differences in the way they try to heal themselves. Connor continues to move straight ahead in his life. He focuses on his work as a failing restaurateur as a way to cope with his loss. He does it blindly though, focusing more on hiding his pain with his actions. He starts a fight with one of his patrons, he starts a fight with his best friend and chef and he’s running his business to the ground. It’s pretty clear he also has a great sense of pride as his refuses to ask his father, a very successful restaurateur, for any help even though his father is the one clear lifeline he has since Eleanor left. Eleanor doesn’t move forward, she moves backward. She also tries to hide the problem but not by acting out. She suppresses it, she tries to hide it and act as though nothing is wrong. After her failed suicide attempt, she retreats to her parent’s home. There she tries equally hard to get them to understand she doesn’t want to talk about what happened. “Why do you need to remind me that something is wrong?” she asks her father. She’s in an environment where people could help her but, similarly to Connor, she rejects that help, though she doesn’t do it out of pride but as a way to try and move past her current situation. Both characters are running in opposite directions as a way to cope with their loss but in doing so they’re simply causing more problems for themselves. They’re also running away from the one other person who survived the same ordeal they did. They’re miserable and emotionally devastated and so they split but that only created another problem for them to deal with: the loss of their spouse. I won’t tell you how the movie ends or any more about how the characters try and cope with their situation. If you’re interested in watching a writer-director’s impressive debut or a drama that is taken seriously by the cast as well as the crew (it’s really a well put together movie), you’ll eventually find yourself in front of a screen playing The Disappearance of Eleanor Rigby: Them. It’s an emotional movie, yes, but it’s not exclusively a sad movie. Unlike many other movies that it vaguely resembles, Them doesn’t deal with a sad subject in a depressive way. Certainly some, if not most, of the characters in the movie deal with a form of depression, they’re not focusing on their pain. They’re focusing on healing. Not forgetting their problem but true healing. It’s a worthy struggle and a lot of it is unspoken and it leaves room for interpretation on the viewer’s part but it’s a worthy subject to deal with. I’d love to tell you I’m happy and proud for Eleanor and Connor but the truth is I don’t know exactly what the future holds for them. All I know is that they’re likely to deal with it together, as a couple. Despite dealing with sadness, Them ends up being a surprisingly hopeful movie.